My Creative Time: MCT "Birthday Palooza!" GOOD MORNING my sweet friends & welcome to another "Birthday Palooza!" Miss Laurie has an AMAZING birthday card for you today! 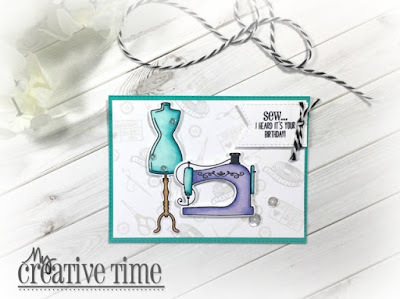 GOOD MORNING Miss Emma.....Miss Laurie's Card is SEW Cute & SEW Adorable...love the play on words...Love these dies!! Wishing you a Tremendously Terrific Thursday and may you have SEW much Craftabulous Fun!! YOU SEW ROCK!! I loved the card! Great idea to stamp a background and wonderful coloring and shading. Wonderful card for those who sew or not! Super a lovely card! love the cute stamp set! !